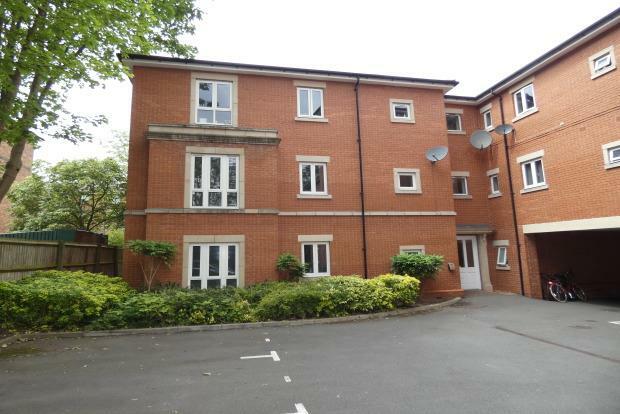 2 Bedroom Flat To Rent in Derby for £650 per Calendar Month. The apartment has been renovated throughout to a high standard, including new carpets, vinyl flooring and newly painted dÃ©cor. The apartment briefly compromises of an open plan living area, kitchen, bathroom, two bedrooms and an en-suite to the master. The entrance hallway has been laid with new, grey, parquet vinyl flooring, giving access to hallway cupboards, open plan living area, two double bedrooms and family bathroom. The large lounge area is laid with new, grey carpets and has been neutrally painted throughout. On the other end of the living area is the modern cream gloss kitchen with wood effect, roll preparation work surfaces, fitted with a modern range of matching wall and base units. A breakfast bar and stools are included. Complete with double glazing windows and efficient electric heating. This bedroom is laid with newly fitted grey carpets and neutral painted dÃ©cor, fitted with a modern, three piece en-suite bathroom. Complete with double glazing Upvc windows and efficient electric heating. This bedroom is laid with newly fitted grey carpets and neutral painted dÃ©cor. Complete with double glazing, UPVC windows and efficient electric heating. The bathroom is laid with lino flooring and neutrally painted walls. Partially tiled with splashbacks around the bath and sink area. Fitted with a modern three piece bathroom suite and shower. Complete with a chrome towel radiator and extractor fan. To the front of the property there is secured allocated parking for one car via the electronic gates. The property is let unfurnished. Available for occupation and viewing now! Don't miss out!